Canoe Ridge Creations: announcing | sparkle quilt along. 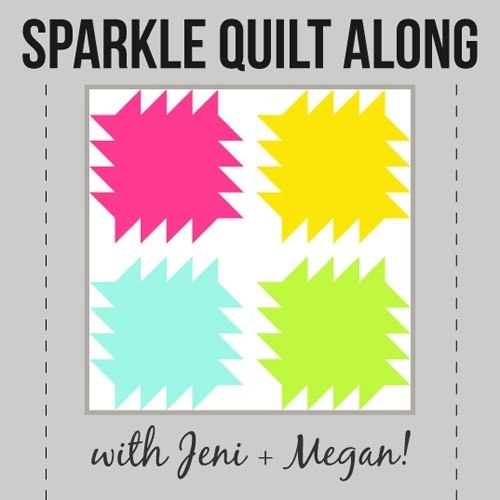 announcing | sparkle quilt along. 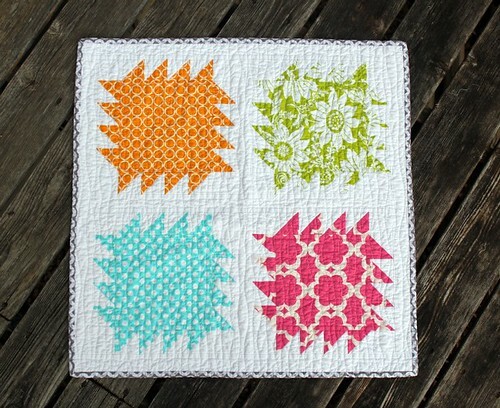 i am SUPER excited to announce that i will be co-hosting a quilt along starting next month! 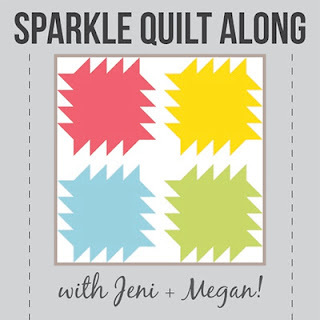 jeni from in color order and i are pairing up to bring you the sparkle quilt along and we hope you will join us! 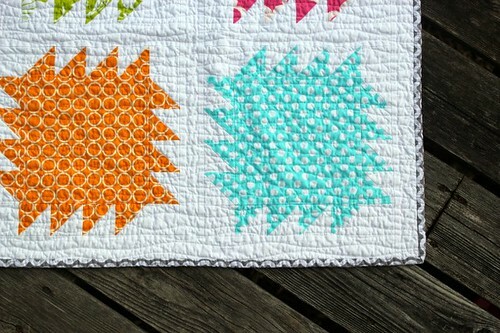 this simple, modern quilt design is perfect for all sewing levels, beginner to advanced! over the course of six weeks we will be sharing instructions for four different quilt sizes (mini, baby, lap, & twin) to fit your lifestyle! January 12 -- week one: choosing fabrics. January 19 -- week two: cutting. January 26 -- week three: assembling the blocks. February 2 -- week four: putting the top together. February 9 -- week five: finishing up. February 16 -- week six: linky party. here's my sparkle mini quilt! so enjoy the holiday season and time with your friends & family and join us for the sparkle quilt along starting January 12th! in the mean time, feel free to join the flickr group and grab a button! UGH! I wanna do it!! hopefully I'll have most of my UFO's completed by then... erg! If not I'll have to muster up some will power, lol. ooo how exciting! 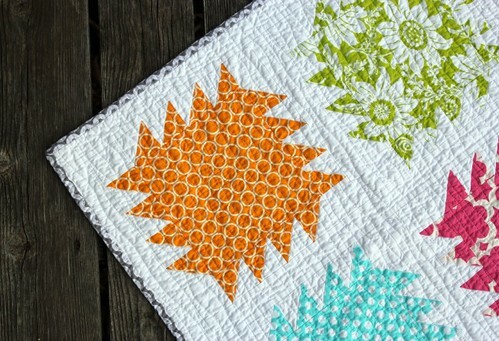 I love this pattern, perhaps I will use this quilt along as motivation to make my very first quilt! it looks very tempting, i love the design. Count me in! I'm most excited :) Yay! My first quilt along!!! Count me in too! I feel like I will finally be able to commit since I have gotten so many things in order! yay! can't wait! I love this! The colors are perfect! Great job on the design! This is so pretty!!! 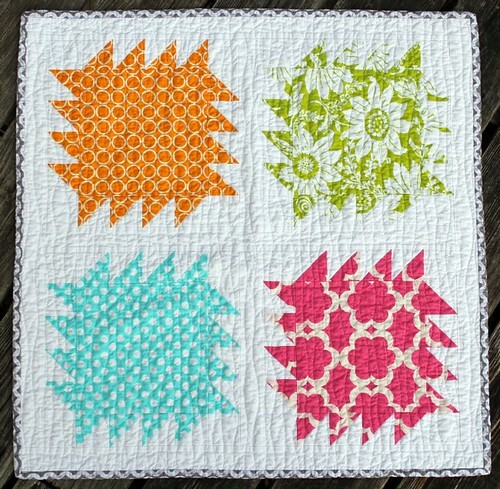 Love the quilting lines. Hi, Megan. 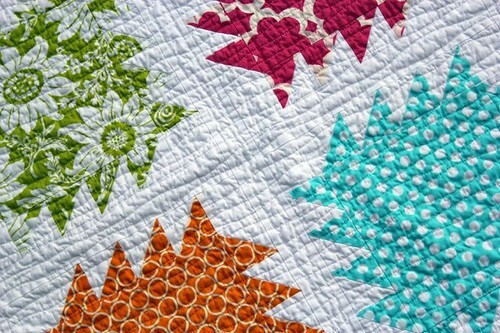 Your mini sparkle quilt is adorable! I like your fabric choices. Happy holiday stitching! What a cheery way to begin the new year! Sounds like fun! I would definitely be making the mini. I'll be joining in for sure (o: Lovely 2012 challenge. Joined the Flickr group and put the button on my blog!